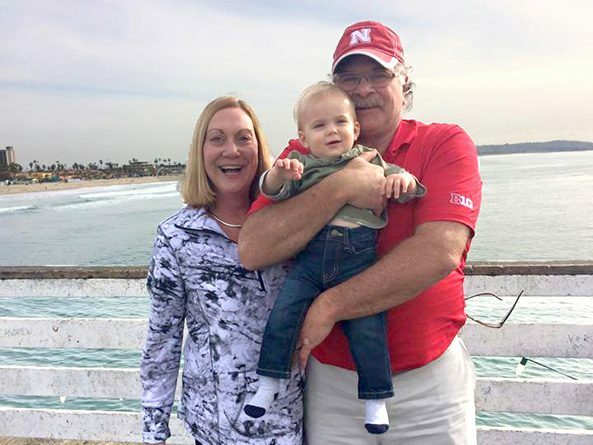 Above: Sen. Craighead and her husband Richard Hoback relish the opportunity to visit grandson Edward in San Diego, where he lives with his parents, Commander Ted and Mrs. Carrie Hill. “Listen twice as much as you talk. When we listen, we learn.” This proves to be valuable advice for any new senator. The senator is a sixth generation product of Nebraska City, where her grandfather, Edgar Ransdell, served as mayor. After high school, Craighead moved to Omaha and earned her bachelor’s degree in medical technology from the University of Nebraska Medical Center. She later earned a master’s of public administration from the University of Kansas. She shifted her focus to the business world, starting several companies and organizations with a specific focus on helping people put their best foot forward. She became heavily involved in local and national pageants as both a consultant and judge. Craighead channeled this experience into “First Impressions,” allowing her to teach people the importance of self-care and confidence. “I truly believe that if we look good, we feel good. If we feel good, we can take care of the business at hand and care for others,” she said. After her move to Topeka, Kan., the future senator met Michael Craighead and the two were married within six months. He had a daughter, Jennifer, and the couple later welcomed another daughter, Staci. A Vietnam War veteran, Michael was later diagnosed with cholangiocarcinoma—a cancer of the bile ducts—which was attributed to his exposure to Agent Orange during the war. Michael ultimately lost his battle with cancer in 2007. Despite the devastating loss of her husband, Craighead focused her attention on helping others battling the rare disease. Along with four other individuals in Houston and Salt Lake City, she co-founded the Cholangiocarcinoma Foundation to search for a cure and improve the quality of life for those who have been diagnosed. “I thought it was a very positive way to deal with his death,” she says. Craighead found herself looking to regroup and refocus her energy on the positive. She founded a real estate development company, working to provide affordable housing in Omaha. A chance meeting at a Nebraska City concert a few years later provided an opportunity to reconnect with an old high school friend, Richard Hoback. “I walked right up to him and said ‘Why don’t you ask me to dance?’” she said. “And the rest is history.” They were married in 2012. He has two grown children: Carrie and Kyle. Somehow Craighead does find time for hobbies. A visit to her Capitol office is a testament to her creativity and craftiness. Craighead sewed the cushions on her chairs and curated the art that adorns the walls. She even plans on writing again, although free time may be harder to come by these days. Her close friend, the late Sen. Pam Brown, gave Craighead her first real exposure to the Legislature. Despite learning a lot from Brown, she says she never really gave too much consideration to serving in the Legislature. Her husband, on the other hand, knew better. “I really hadn’t thought about running. When I asked my husband if he thought I should run, he said ‘Honey, I love you more than life itself, but you do realize it’s all you’ve been talking about since we met,’” she said, laughing. The new senator says she is continuously looking for solutions that can be a win-win both for residents of her district and the state at large.